I finally figured out how to post pictures. First pic with the stiches is 5 days post op, the second pic is 9 day post op when I got my stitches out and the last pic is 14 days post op when I took the tape off. Well first day of PT today…pretty uneventful. I feel fabulous and am healing great, but with the extent of a few exercises and a massage I still need to wait for anything hard. BOOOOO LOL. I guess the dream I had of a great workout is down the road, bummer. But forever the optimist I am walking bearing full weight on my Vacocast and today was my first day driving…so at 13 days post op not bad. It will be another week or two before the hard PT stuff starts. 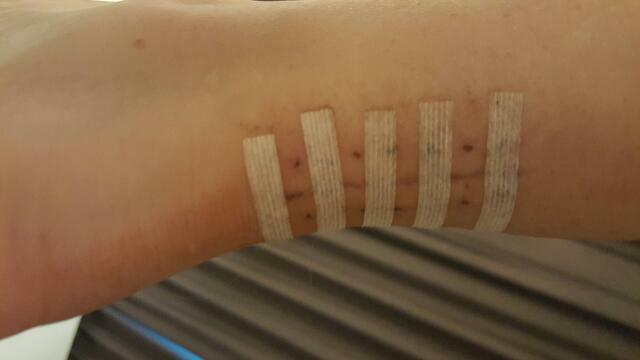 I have pics I wanted to post of my incision just so you guys could see if you think the hyperbaric chamber really did help, but I have zero clue how to get them up here. I will work on that. 2 GREAT things…stitches out and Vacocast arrived WOOT!!! So what I want to share and believe me I am not some crazy witch doctor. If it is in your power with this injury (or any injury needing healing) consider looking into getting yourself in a hyperbaric chamber for 5 visits following your surgery. I realize this is not covered by insurance and it can be expensive, but it it is in your means to do…look into it and do it. I have no doubt this has been the key to my recovery…if my Achilles is healing like the incision on the outside I am thrilled. When I was in the chamber I actually felt my Achilles area sizzle almost like falling asleep or hydrogen peroxide on a wound. That was the healing process no doubt. My visits cost me $165 for about an hour and a half in the chamber. I did 5 visits starting the day after the surgery…I am not sorry at all. My second theory is find the right Orthopedic Surgeon…do not go to some old as dirt guy/girl who are going to keep you in some old school protocol. There have been amazing advancements with this injury that do not require 10 year old treatment protocol. So really look into your OS and ask them what their treatment is like…the Doctor and how they allow you to heal is a HUGE factor in how bad this injury is to you life and the quality of your life and your mental state. If it were not for my tears, research, frustration and great Doc I would be just a huge sloppy mess. Really research this injury, read everyones blogs, ask questions and make the best decision for your health and well being. Well enough of this 10 pound Frankenstein boot they gave me at the hospital. I ordered myself the Vacocast this morning. I figured I am going to be in it walking around forever so I might as well have something lighter and more comfortable. Plus all the money I am going to save on buying myself any cool shoes for the Summer can just go to pay for one shoe LOL. Hoping I like it as much as everyone else does. Any pointers from users let me know…Thanks!!! Well…I want to say hello and thanks to everyone for all of their valuable posts and information. This bar none has been one of the craziest injuries of my life and I feel alot less crazy and depressed knowing that there are others like me out there. 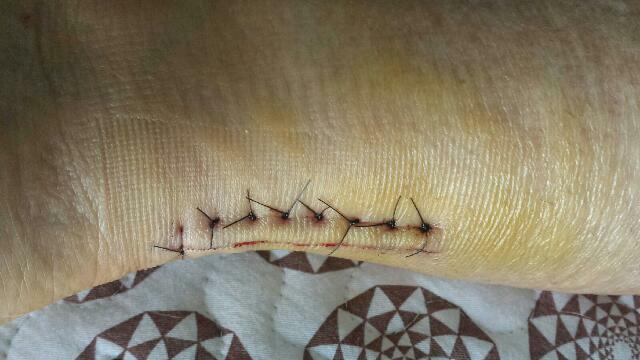 I ruptured my achilles about 2 weeks ago and am a week post op. I ruptured my achilles sprinting to save a giant turtle from death as he was crossing the road…the irony LOL. I have never had any part of my body fail me…I have been like a thoroughbred race horse my whole life so as I am sprinting in the road wearing my Nikes and all of a sudden a pop happens and I feel like my heel is no longer attached to my leg…I just could not believe it…really I still can’t. The first 24 hours were horrific for me psychologically (and I have a mind of steel), but reading all the stuff people say did my psych more harm than good. It took me seeing my ortho surgeon to set my mind at ease, like this ain’t no big thing. Within 24 hours I ordered myself that cart with a basket from Amazon and one of those covers for my leg so I could bathe…taking no bath or shower is not an option. I duct tape that thing on my leg and clean up…this in itself helps me feel better. I am one week post op and I want to share what I have been doing. My surgery was on a Tuesday afternoon and Wednesday morning I was in a hyperbaric chamber for an hour and half…I did this for the first 5 days. This is not covered by insurance, but I am making an investment in my health and recovery here. I have also been sleeping on an Amythest bio mat. My doctor was nice enough to agree to put me in the boot right after surgery…and that alone has been a Godsend. I take it off to air it out at night and wiggle my toes etc. One of the nights last week I fell asleep without my boot on…I was on my pain pills and I slightly remember having a pain in my leg. I have completely freaked myself out to the point that I called my doctor today and asked him to see me tomorrow morning to “make sure” that I didn’t do something to my tendon in my sleep that I vaguely remember because of narcotics. I am doing this because I almost feel TOO GOOD…zero pain, zero swelling, bruising that was from before, my incision looks like a paper cut with stiches, I can point my toes like a ballerina…the only thing I refuse to do is flex my foot or put any weight on it whatsoever. Either I am healing like a sci-fi film or in my sleep I just tore the crap out of everything and there is nothing left to feel bad. So I am going to my ortho surgeon to get a piece of mind or hear the worst news in the world. I am literally laughing at myself as I am typing this because I sound like an obsessed hypochondriac which is like the furthest thing in the world from what I am. Lets just say this injury has brought out the worst in me. Being dependent on others or asking for help is NOT my strong point. Wow, Phaedz, good for you! I was skeptical about the hyperbaric chamber, and wouldn’t have chosen your protocol, but you’re pretty much where I am at week 14 which is just amazing. Keep it up! Congrats on the amazing progress, and solid advice. You’re right about the initial dark days, and the need to appreciate and celebrate all the milestone victories along the way. Keep up the great work! You were FWB one week post op? With your stitches in? I’m glad you got PT so early on. 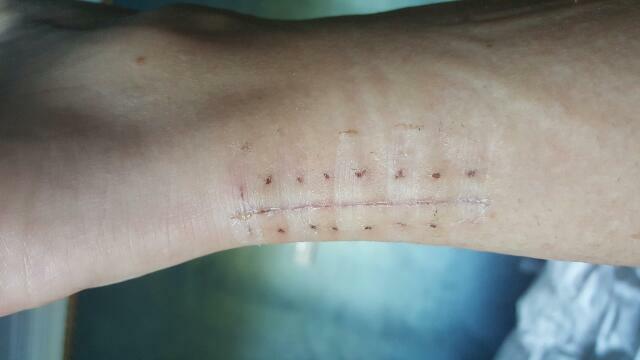 I don’t think my surgeon believes in PT, he didn’t refer for it until the third time I asked, 3 months post surgery. I wish I had started sooner. Click the HTML tab when you are editing and insert a link to your hosted photo when using img tags. Good luck with your PT. Sounds like you’re doing great, Phaedz! My doc wouldn’t let me bear weight until week 6, so we’re on opposite ends of the curve. I’m interested in booking Alter G sessions, too, to get back into running. Another option to consider once you get the green light to start gait training is walking in the deep end of a pool. That’s amazing. Sizzling? Have there been any studies on healing in the chamber? Get yourself an Even-Up. I use one inside on a Croc, and one outside on a hiking boot. Hi phaedz!!! WOW!!!! 9 days and already walking on boot??? I think this is an Achilles blog record!!! I will definitely look into the chamber, I’m 3 weeks non-op re-rupture so I’m in dire need to heal. Thanks for sharing your story it does helps! Keep up the healing! The liners get sweaty and disgusting quick, so order a couple extra. I change mine daily. Get an Even Up for your good foot. I got two - one for indoors (which I wear on a Croc), and one for outdoors (hiking boot). It’s good to avoid limping and spine/hip misalignment as much as possible. Once your wound heals, socks (with or without compression) can be helpful, and you can also take your Vaco cast into a pool for swimming and gait practice! Hey phaedz! The VACOcast is great! Just make sure you know the degree at which you are in your current boot. Mine only goes to 30º PF which is the setting I initially started with non-op treatment. I had a large aircast which was very heavy and floated on my foot. Now I have the medium and it is way more comfortable and light, and keeps my foot really secure. Good luck with the Vasocast - it looks like a good piece of gear. I have been okay with the Aircast but I can see the Vasocast must have some advantages in terms of weight and adjustability. phaedz’s AchillesBlog is proudly powered by WordPress and WPDesigner..